Former Chelsea defender Alex has spoken honestly about player power at Stamford Bridge, admitting that it was an issue during his time with the club. The Brazilian played for the Blues between 2007 and 2012, working under a number of different managers in west London over that period. 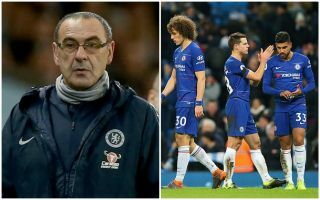 The manager issue is coming up again for Chelsea at the moment as Maurizio Sarri seemingly struggles to win over this group of players after a recent dip in form, coupled with the incredible incident with goalkeeper Kepa Arrizabalaga in the Carabao Cup final defeat to Manchester City on Sunday. The Spanish shot-stopper refused to make way when Sarri tried to sub him for Willy Caballero, and he ended up staying on the pitch for the ensuing penalty shoot-out. Alex says this kind of thing used to go on before, admitting that some players wanted to see certain managers sacked. For him personally, he singled out Andre Villas-Boas as one who was unpopular for his arrogant handling of Frank Lampard, though he also suggested Felipe Scolari encountered problems too. When asked by Goal about player power at Chelsea, Alex said: ‘During my time, yes. I can’t speak about now because I’m not there. But it was there during my time. ‘I saw a lot of situations [like Kepa], especially when the manager wasn’t fond of the players. There were lots of people hoping that things didn’t end up going well and he (the coach, in general) ended up leaving. ‘I think this happens in a lot of clubs. I think it’s normal in football. And Chelsea became very famous especially after what happened with Felipe Scolari, with some people saying Drogba had had a meeting with [owner Roman] Abramovich. ‘I think it happens in all clubs; that a player really hopes that managers will be sacked. For example, I think his inexperience and youth at the time counted against Andre Villas-Boas at Chelsea. ‘I loved his training sessions, he was able to interest the players. But, in my opinion, he was very arrogant in some situations and made some mistakes, especially when he put some great players on the bench. He did it with Lampard. ‘The general complaint was this: he didn’t speak a lot with the players and, when you put someone such as Lampard on the bench, it’s not that you have to explain yourself, but I’ve learned with [Carlo] Ancelotti and with Guus Hiddink that it’s better if you sit with the player to help him understand the situation a little bit more.